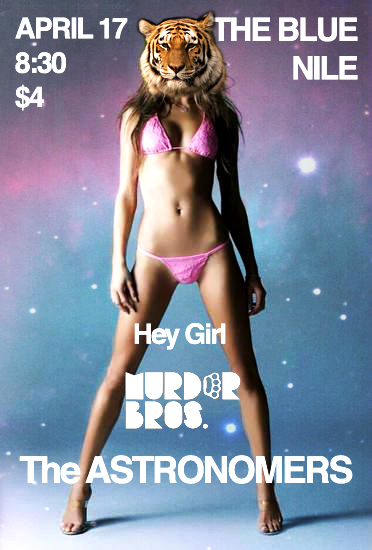 I made this photoshop disaster for the Murder Bros. show with Hey Girl and Astronomers. I like the way it turned out because I was really going for that obviously photoshopped look. I thought "tiger" because a lot of people think that tigers live in Africa (Disney's Jungle Book at fault?). I thought "Brazilian super model" because a lot of people think the Nile is in South America, and i figured if Brazil was in Africa, it would be where Egypt and Ethiopia are on that continent. I thought giant nebula back ground because a lot of people like Astronomers. I guess I over-thought this. But, I love the way it came out, and a lot of people complimented me on it. I think that that's the most rewarding thing about designing things like this. It's not about people "getting" what your process was, but just going "NOICE" when you hand it to them. The guy at the door at the Blue Nile loved it, and someone meticulously drew tattoos on Alessandra (the woman pictured) on one of the flyers taped to the door. It looked awesome. I tried to take a picture, but it didn't turn out. I love when people take work I've done that's been hung up and start drawing on it or adding to it. It's happened a bunch of times, and I'm always glad someone bothered to go to the trouble. I do want to point out how incredible my background isolation is, by the way. It's one of the holy grails of a good designer or at least photoshopper, but no one outside of the design community ever comments on it. And you only really get to talk about it when someone blows it. For people not paying attention, the catalog perusers of America, the painstaking work that goes into background deletion or alteration goes unnoticed. So when you look at the .psd above, I want you to look at how that background looks like it belongs there it doesn't look like I grabbed another image from somewhere and duplicated her a couple times, did a quick mask, and blurred edges, and used various layer blending options to make it all look like it belongs. The tiger head on the other hand, was a joke, and was meant to look a little cut and pastey. . . but there's actually an art to that, too. I did adjust the light source a bit to look like the light on the tiger was the same light that was on the girl's body. I hope you count yourself, dear reader, as one of the people who enjoy this flyer.